SK Hynix, the world’s No. 2 chipmaker, on Monday said it planned to mass produce 8-gigabit LPDDR3 mobile DRAM chips as early as the end of this year. Developed as the world’s first 8-gigabit product in its class, the LPDDR3 was created by applying 20-nanometer-class technology, and is more advanced than the 4-gigabit LPDDR3 being produced by Samsung Electronics. SK Hynix’s newest product features high density, high speed and low power consumption, which together make for an ideal memory product, company officials said. 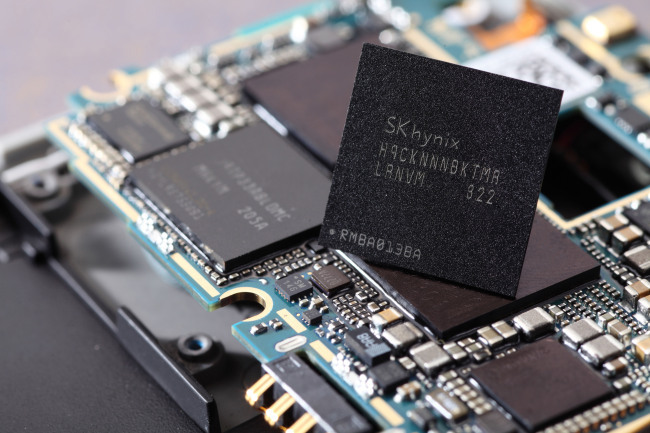 “With the development of this high-density LPDDR3 using 20nm class, SK Hynix is now able to supply a top-performance product suitable for mobile devices to the market,” said senior vice president Richard Chin, the head of the firm’s global sales and marketing. The new products can be stacked to realize up to 4 gigabytes in a single package. The chip, meanwhile, becomes dramatically thinner than the existing 4Gb-based DRAM, meaning that in both density and package height, the newest LPDDR3 is ideal for the latest generation of slimmer devices. Speed has also been enhanced significantly, as the latest mobile DRAM is capable of realizing a data transmission speed of 2,133 megabits per second, which surpasses the 1,600 Mbps of existing products.